Biography of English Pre-Raphaelite Painter. Religious and somewhat obsessive, the English painter William Holman Hunt was one of the founders of the influential Pre-Raphaelite Brotherhood art movement. After studying under a London portrait artist, and then attending the Royal Academy of London art school, he became close friends with Sir John Everett Millais (1827-1910) and Dante Gabriel Rossetti (1828-82). In 1848, they formed the Pre-Raphaelites, a movement which championed the classical poses and natural compositions of Raphael (1483-1520) and his predecessors. Hunt's early work attracted abuse and derision, but by the 1850s he had won an increasingly admiring audience. By 1905 he was so well respected that he was awarded the Order of Merit, and on his death in 1910 he received a state funeral. His best known works include The Awakening Conscience (1853, Tate Gallery, London) and The Lady of Shalott (1886-1905, Wadsworth Atheneum, Hartford). Regarded today as a true representative of Victorian art, prone to insistent moralizing, whose zest for detail and colouring tends to be counter-productive. Another painter whose works - like those of Hunt - caught the mood of Victorian England was the popular animal painter Edwin Landseer (1802-73), best-known for his sentimental portraits of dogs. Hunt was born in London in 1827. He grew up in a religious household, and spent many hours in his youth reading the bible. At the age of 12 he left school and started working in an office as a clerk. He hated the work, and dreamed of becoming an artist, his imagination and vision being a key driving force. He studied part time with a portrait artist, and eventually convinced his parents to allow him to attend the Royal Academy of Arts London full time. However he rapidly became disillusioned with the aesthetics of British art, feeling there was little in it to contemplate or emulate. When he read 'Modern Painters', written by the eminent art critic John Ruskin, he was impressed with the argument that artists should return to the style of late medieval and early Renaissance artists. Imaginative and religious, Hunt wanted to imbue art with a form of symbolism that had been lacking in modern times. While at the Royal Academy, he met Millais, and the two discovered they were thinking along the same lines. Millais and Hunt worked towards getting their first paintings accepted for the 1848 Royal Academy Exhibition. Primarily Hunt was anxious to start earning some money. Millais' was rejected, but Hunt's The Eve of St Agnes (Guildhall, London) was accepted. Based on a poem by Keats, the picture drew Hunt into contact with Dante Rossetti, and the Pre-Raphaelite Brotherhood was formed in September 1848. Although originally the term Pre-Raphaelite was applied exclusively to Hunt and Rossetti's group, it was later applied to all British art of the 19th century which was dreamy, romantic and pseudo-medieval in style. The group soon expanded to seven members when the artists William Michael Rossetti (1829-1919) Dante's brother, James Collinson (1825-81), Frederic George Stephens (1828-1907) and Thomas Woolner (1825-92) joined. As a movement they rejected what they considered the formulaic style of the Royal Academy London which was led by Sir Joshua Reynolds. They called him 'Sir Sloshua', believing his technique was sloppy and an academic form of Mannerism. In contrast, the Pre-Raphaelites wanted to return to romanticism and pictures which were highly detailed, intense in colour and reflective of the complex traditions of Quattrocento Italian and Flemish art. Some art historians view the Pre-Raphaelites as one of the first modern art movements; others disagree, citing their roots in historic art and the importance they placed on naturalism, or imitation of nature. Other painters and sculptors who associated with the group included Lord Frederic Leighton (1830-1896), Alexander Munro (1825-71), Charles Allston Collins (1828-73) and Thomas Tupper, along with Ford Madox Brown, William Dyce, JF Lewis, Arthur Hughes, WL Windus, Frederick William Burton, Frederick Sandys, Walter Howell Deverell and the esteemed Edward Burne-Jones. The Brotherhood held their first group exhibition in 1849 and Hunt exhibited his painting Rienzi Vowing Justice (1849), depicting a scene from Edward Bulwer-Lytton's Rienzi. Hunt was inspired by Romantic poetry, and it was those subjects that drove his work. As a group, the Brotherhood were innovative in their technique, using bright colours on white backgrounds which gave their works a fresh and luminous feel. They relished detail; a leaf could be painted with mold or dirt, imperfections were celebrated. They took Ruskin's 1851 pamphlet on art to heart, where he wrote 'they should go to nature in all singleness of heart, and walk with her laboriously and trustingly, having no other thought but how best to penetrate her meaning; rejecting nothing, selecting nothing, and scorning nothing'. In 1850 the group held another exhibition, and Millais' painting, Christ in the House of His Parents caused a stir among critics, who rejected the medievalism of the style. According to Charles Dickens, Millais made the Holy Family look like a group of 'alcoholics', with their contorted and 'absurd' medieval pose. 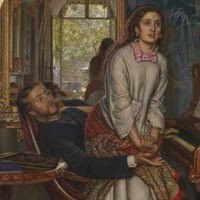 It wasn't long before the Pre-Raphaelite Brotherhood became known publically as a group, and their principles were attacked by the new President of the Royal Academy, Sir Charles Lock Eastlake. After this, the movement disbanded. Although Hunt and the others continued to work in the romantic style, they no longer signed their paintings PRB. In 1852 Hunt applied for associate membership of the Royal Academy, but was refused. He never applied again. After 1850, Hunt, along with Millais moved away from direct imitation of medieval art. Hunt in particular believed that realism was important but also wanted to emphasis spiritualism. In 1854 he exhibited two paintings heavy with moral symbolism: one was religious (The Light of the World, Keble College, Oxford) and the other secular (The Awakening Conscience, Tate Gallery, London). He wanted to reconcile religious art with science by making accurate biblical studies, on location in Egypt and Palestine. In 1854 he travelled to Palestine and painted on the shores of the Dead Sea. His first work from this period was The Scapegoat (1854, Lady Lever Art Gallery, Port Sunlight, UK), where a goat is put out to die in a harsh, but colourful landscape. He spent the next few years painting in Florence and Palestine, labouring over his Orientalist painting - notably religious works which contained highly detailed studies. Back home, these paintings were well received, and improved his reputation. Reproductions sold well, finally bringing about some financial security. Hunt and Rossetti's Pre-Raphaelitism was the most significant art movement of the Victorian age in England. It triggered renewed interest in the decorative Arts and Crafts Movement championed by the medievalist William Morris and others, and checked the decline in English painting apparent in the early years of the 19th century, while Pre-Raphaelite inspiration can still be seen in the work of many English painters of the modern school, alongside elements from foreign sources. For instance it had an important colouristic influence on Sir Lawrence Alma-Tadema (1836-1912). The Lady of Shalott (1886-1905, Wadsworth Atheneum, Hartford) was one of Hunt's last paintings, and is perhaps the most famous of the Pre-Raphaelite movement. The huge dream-like canvas depicts Lord Tennyson's poetic heroine the Lady of Shalott of Camelot. In his last years of work, Hunt became renowned and respected the world over. He died in 1910 and was awarded a state funeral. Today his paintings can be found in the city galleries of Liverpool, Birmingham and Manchester, and internationally in some of the best art museums in London and America. A few years before his death, he published his two volume book Pre-Raphaelism and the PRB (1905), a passionate account of his work and principles. Pre-Raphaelitism was an important influence on contemporary British painting of the early 20th century, as well as the wider European Symbolism movement. Although non-representative art became more and more popular during the 20th century, there has been a renewed interest in the Pre-Raphaelites in recent years.